Did Ohio State Lose A Bet To Put Michigan Colors On The Horseshoe? This is the first in a series of stories looking at legendary moments in Ohio State football history. Did they really happen the way the story says? We went back and checked original sources to find out. Ohio State and Michigan placed a bet on the outcome of the 1922 Ohio Stadium dedication game. The losing team would be forced to incorporate their opponent’s colors into the design of their stadium. Michigan won, 19-0 and that’s why there are blue and yellow flowers in the North Rotunda of the Horseshoe. The bet definitely did not happen the way the story goes, and probably didn’t happen at all. 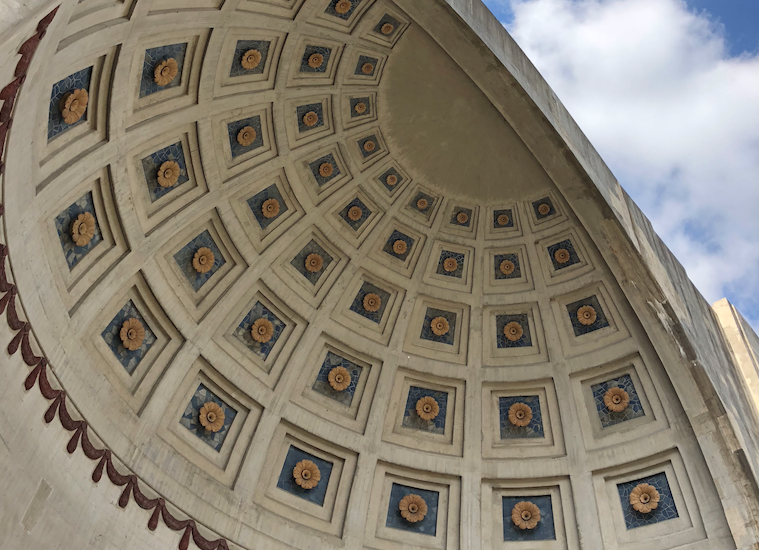 Yes, there are blue and yellow flowers on the Ohio Stadium Rotunda on the closed end of the Horseshoe. And yes, they look incredibly out of place. But no, it’s not because of a bet on the Dedication Game. This is one of those college football legends that gets repeated, even by normally reliable sources. That’s probably because it seems to fit the basic facts most people know about Ohio Stadium. Nicknamed ‘The House That Harley Built’ it was a response to growing interest in Buckeye football spurred by star running back Chic Harley. Architect Howard Dwight Smith was commissioned to design the stadium in 1918. The first model was unveiled to the public in October 1920. Ohio Stadium opened its doors in time for the 1922 football season. The Buckeyes won the first two games in their new home, defeating Ohio Wesleyan 5-0 and Oberlin 14-0. However, the school decided to hold off on the official dedication ceremony until the October 21 game against their rivals from Michigan. The entire week was an extended celebration. The night before the game, both schools held pep rallies in Columbus. On Saturday, the governors of both states attended the festivities, along with the reigning Miss America, and a bicycle maker from Dayton named Orville Wright. The marching bands from both schools played the national anthem together, followed by an 11-cannon salute. Once that game started, however, it was all Michigan. Halfback Harry Kipke scored two touchdowns and also kicked a field goal as the visitors won, 19-0. So that part of the story is true. However, there is no mention of a bet in either of the Columbus newspapers from the following day. There is nothing in the Dayton Daily News, nor the Cincinnati Enquirer. There is a reason for that: those yellow flowers on blue backgrounds were part of the construction plans more than a year earlier. 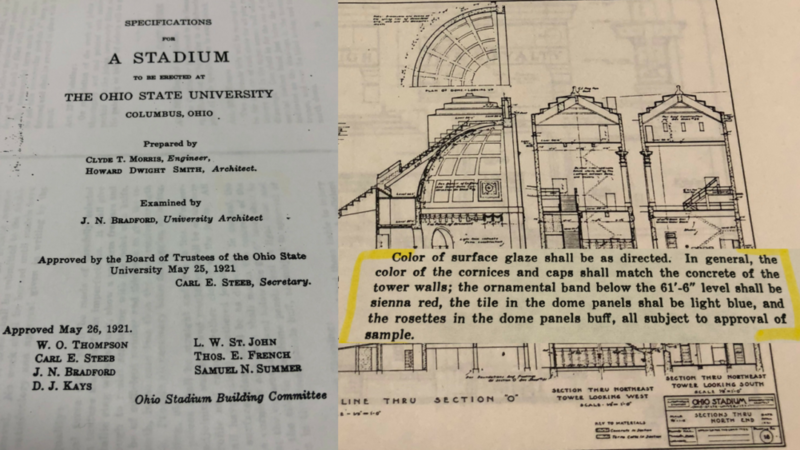 In the Ohio State University Archives, you can find a copy of the specifications for the stadium’s construction. They were approved by the OSU Board of Trustees on May 25, 1921, nearly 17 months before that Dedication Game. One day later, the Ohio Stadium Building Commission, including William Oxley Thompson and Lynn St. John approved them. This was approved more than a year before the bet on the Dedication Game supposedly happened. Again, this all happened 17 months before the game on which the bet was supposedly placed. But that’s probably not the case, either. The Buckeyes won at Michigan in 1921, the year before Ohio Stadium opened. They also won in 1920, beating their rivals in front of a packed house of 21,000 at Ohio Field. They won in Ann Arbor in 1919 as well, which was when Harley led the Buckeyes to the first win over the Wolverines in school history. Michigan’s most recent win in the series had come four years before the stadium was dedicated, in 1918. So believing in the bet means that the wager was on a game that happened before the stadium had even been designed. It also means that OSU would have made a bet that involved something literally unprecedented in school history. And it also means that this bet and its mark on the stadium went entirely unremarked upon during the dedication and the resulting news coverage. Oh, and also that the Ohio State University Archives would have no record whatsoever of it. The bet on the Stadium Dedication game that put Michigan colors on Ohio State’s stadium is a fantastic story of the permanent bonds joining college football’s greatest rivals. But it’s almost certainly not true. The next question is why those blue tiles are there. That’s not so clear. The file that the OSU Archives has on the construction of the Horseshoe doesn’t provide a reason. There is nothing referenced in newspaper coverage of the Ohio Stadium groundbreaking on August 3, 1921. There was also no mention of the blue tiles in newspapers on the day after the board approved the specifications of the stadium. It was widely reported that the Rotunda’s design was inspired by the Pantheon in Rome, but there was nothing specific about the colors of the tiles. If you have a lead on any documents from the time that could help solve that mystery, please leave a note in the comments below. “Who cares? He tells it well!” Chief Miles O’Brien. I heard the lost bet story and I like it. I even don’t mind it being there because really throwing down the gauntlet is great for a rivalry but in the end it’s a game we either play or follow. Though we talk about eternal hatred we still work with TTUN grads, still steal their children (think the Borens) and all the other things that bond us as humans in enjoyment of the greatest spectacle in Sport. I love articles like these!!!! Is it true that Woody physically pushed his out-of-gas car across the state line to avoid paying for gas in Michigan? As a child I was told they placed 45 maize and blue roses on the Horseshoe in honor of Archie Grifin because he wore #45, owned the team up North by never losing to them, and going to the Rose Bowl in each of his four years at Ohio State. Just wait until tomorrow’s entry when Tom destroys Santa. Don’t tell me that Santa is from Michigan! Come on, Buckeye fans don’t call it Michigan, they call it The Pole Up North. Nice job and great pull on that blurb in the construction plans.